If you remember our article on Alex's E28, you may just remember our names. After that was posted, Mike graciously asked if we would consider submitting some more articles. 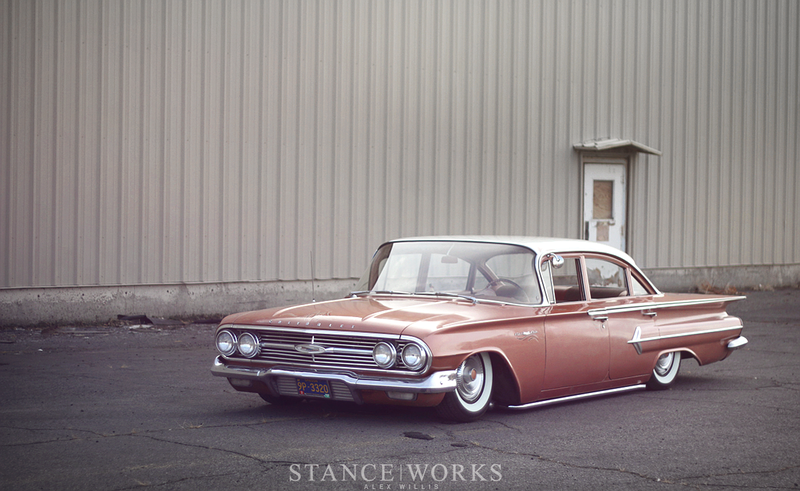 Alex and I talked about it and knew right away what our first submission would be, Adam Huddart’s 1960 Bel Air. 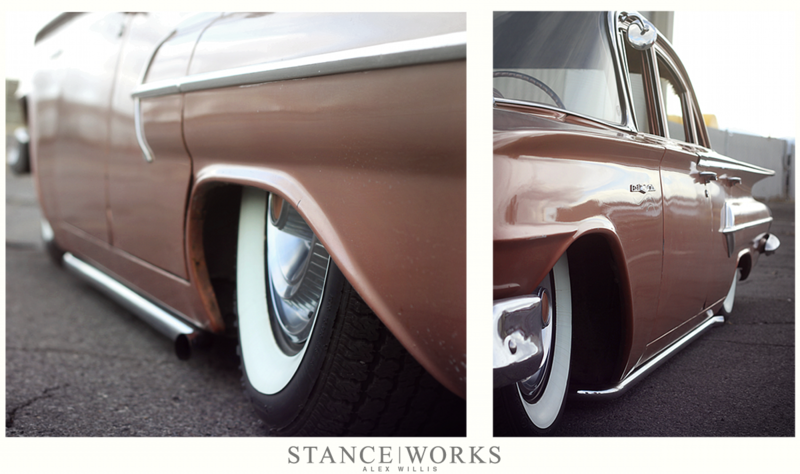 It’s just that quintessential "car guy" car that we knew Stance Works viewers would love. It doesn’t completely follow any one genre, just like Adam himself. With a background in mini trucks, lifted trucks, VWs, hot rods, and everything in between, Adam is a true car enthusiast. Someone who appreciates the things on these pages just as much as what’s in the latest issue of Rod and Custom; the kind of person that has at least a few little things done to customize any and every car he’s owned. Someone who builds a car to enjoy, for himself, his family, and his friends. Once we got the go ahead, I made sure to ask Adam the next time he stopped by the shop. 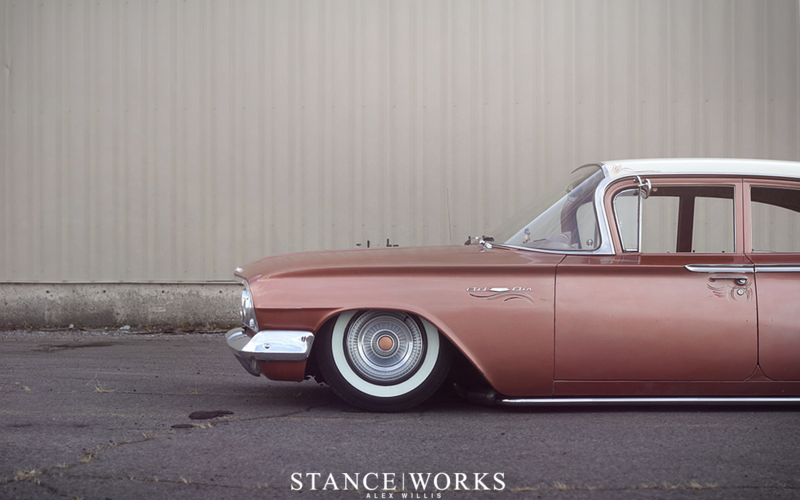 “Hey, Alex and I are going to do some articles for StanceWorks and we’d like to do a feature on the Bel Air, what do you think?” The reply came with a puzzled look. 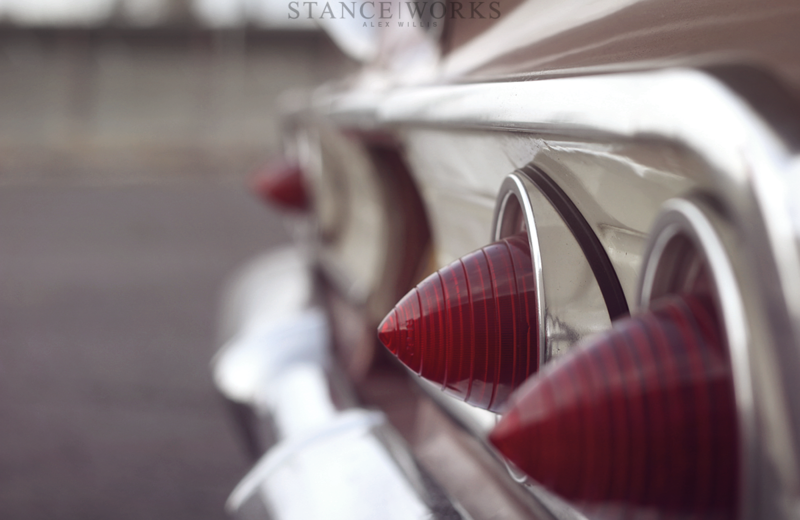 “StanceWorks? What’s a feature?” Then, it dawned on me. Adam and his group of guys, the Vintage Rollers, aren’t tainted by the internet like so many of us today. They’re just guys that like cars, who know other people that like cars, who know how to do what they think is cool to them. They don’t have the instant gratification of the forums, or other websites like this one. They get a few magazines a month and go to car shows in the summer, but otherwise, it’s all about their own enjoyment, not that of 71,000 forum members. It’s a refreshing outlook, to say the least. 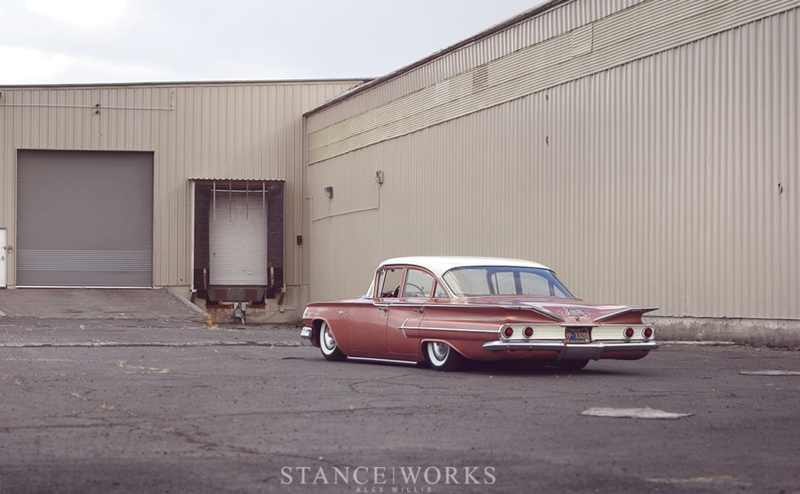 As with any good build up, this 1960 Bel Air has a back story. It’s gone through no less than 3 of Adams friends since it was found in 2004. The first guy threw some Mexican blankets over the seats, cut the springs and called it good. 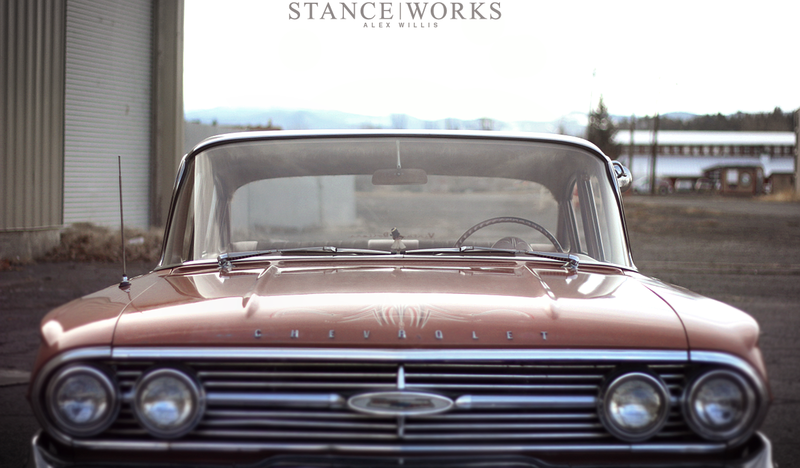 Once the original motor started to show its age, he swapped it out for a 235ci from a '62 Chevy. It was then traded to a couple, who kept the car for about a year in the same shape. After that, Adam’s then-roommate got a hold of it and drove it all the way from Salem, OR to Tempe, AZ, where it was used as a daily driver until mid 2010. By this time, the car, its owner Antonio, and Adam had all made their way back up to Bend, OR. Adam finally got his hands on the car in September of 2010; it was in rough shape by that point. He went to work, stripping out the ratty old interior and having everything re-done by a local upholstery shop. Once the interior was out, some rust issues in the floor pan were taken care of, as well as tunneling the floor for more driveline clearance. Adam drove the car as it was for about 9 months. It was around then that he started the Vintage Rollers club with a few friends, which helped motivate him to take the Bel Air to the next level. First, he tackled an old botched quarter panel repair, smoothing it all out and matching the surviving original paint as closely as he could. The roof and rear panel were shot in a cream white color at the same time to give this land yacht some more contrast. 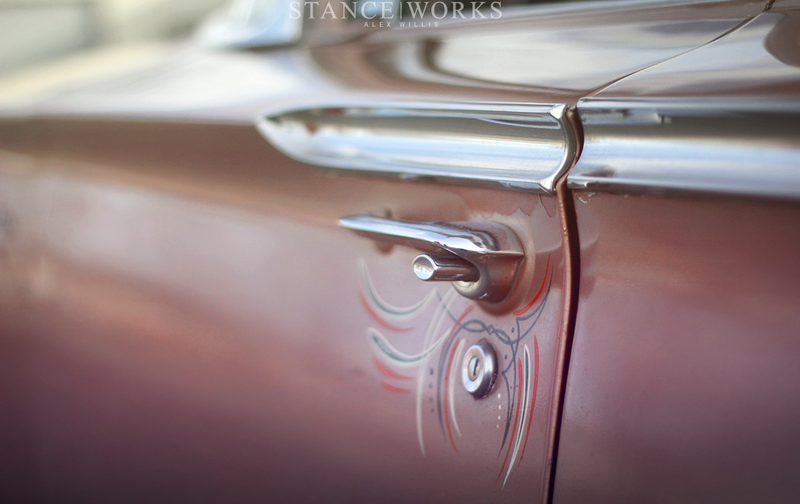 Pinstriping by Charles Cook has been added along the way, both inside and out. The car had lived its last static low moments around this time. Ready for a change, Adam installed a custom built air ride setup with help from his friends in the club. They used custom made cups and 6” double bellow bags all around to replace the factory coils. Terry at OSVW was commissioned to make new shock mounts that house the heavy duty truck shock absorbers needed to keep a car of this size under control. Management consists of tried and true 3/8” ASCO valves with a 7 switch AVS controller. Dual Viair 380’s feed a 5 gallon tank that sits behind the rear seat. For fun, Adam has installed a vintage train horn found at a swap meet under the hood. Rolling stock consists of 2 ½-inch whitewalls on black 15" steel wheels with some LTD hubcaps that Adam had previously hung as wall art in his garage. 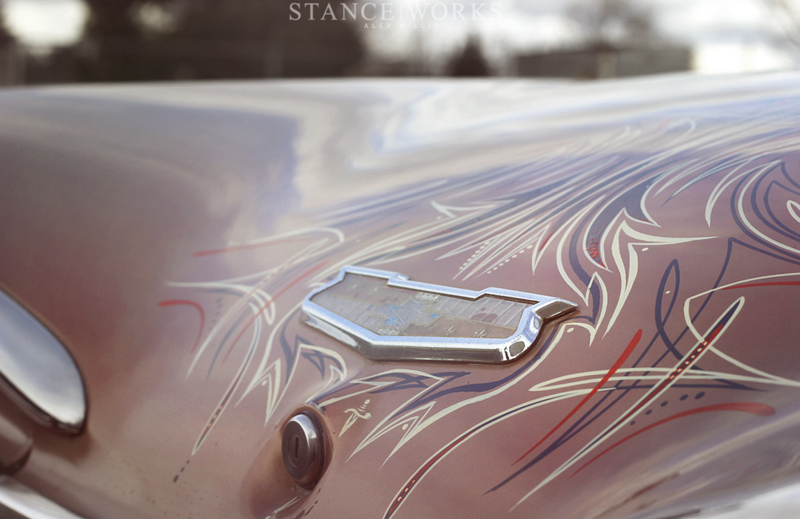 The result is stunning; it’s a classic, timeless look, somewhere between traditional kustom and lowrider. Inside, you’ll find more pinstriping tracing the faded factory paint on the original steel dash, as well as on the mounting panel for the air pressure gauges. Since Adam drives this car nearly every day, he’s added a modern stereo system, all hidden from view. The headliner is one of the coolest pieces inside the car, covered with a sasquatch-like, brown, furry fabric. Under the hood, the ’62 235ci “Blue Flame” straight six has been refreshed with all new seals and a Motorcraft 2bbl carb conversion. A set of Fenton cast iron headers provide some added performance as well as more vintage feel to the engine bay, while chrome lake pipes finish off the exhaust in a very period correct and stylish manner. Future plans include an engine driven compressor and a Hurst floor shift conversion for the newly rebuilt 3spd manual trans. 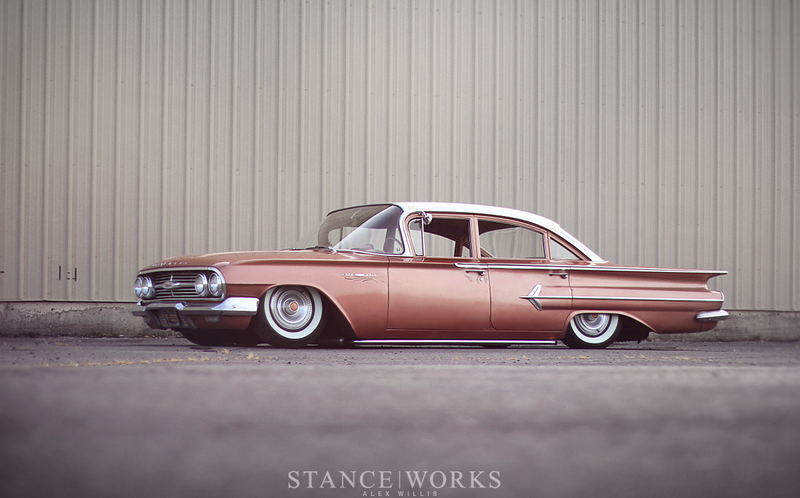 Adam’s Bel Air reminds us that cool cars don’t have to have a build thread; they don’t have to be featured on blogs, or posted all over facebook. It takes you back to a time when car culture was simple. There are gems like this hiding in plain sight in almost every town, cars of all kinds with owners that just seem to get it. When you see them, give them a real life thumbs up. They deserve it. 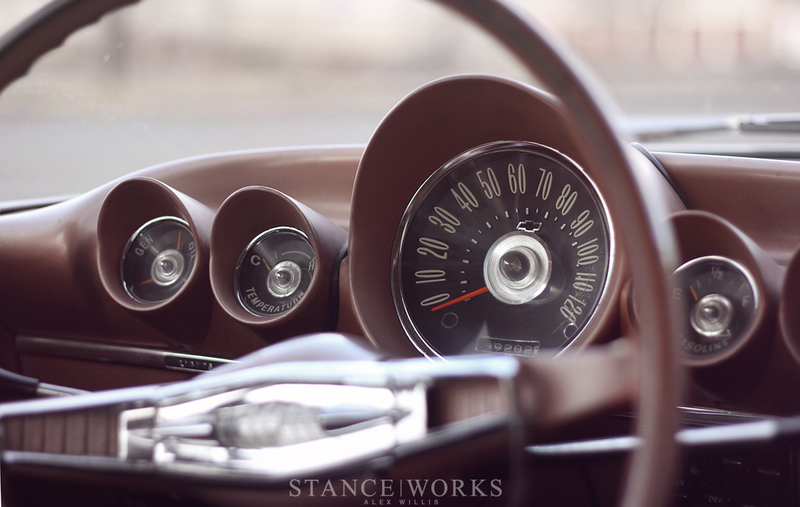 once again, a great article a bit out of what Stanceworks is traditionally, it is refreshing! Awesome car, story and pictures but you talked about the masterpiece of this car being the headliner and no photo! Uncool! ahah! Here is a picture of the Headliner. Not as good of a photo as Alex would take but a picture none the less. His bag set up is so awesome!also the color, is spot on. thanks @Adam huddart and man, see it in motion on the short movie is absolutely fabulous! love this kind of cars and atmosphere!